You are here because you are looking for educational toys for your toddler. That’s a challenging thing to do, given the fact that babies and toddlers have certain needs that you should pay close attention to. As a parent, you need to be very careful when picking any item for your little ones who have crucial needs. So what are the best educational toys for kids and toddlers? We’ve got a list of product reviews for you. Read on and find which one is the perfect item for your child. This activity cube features five different types of games that can stimulate your child’s mind: animal matching, ABC tiles, curvy bead mazes, racing car rollers, and peak-a-boo open and close doors. With the number of featured activities, this item has the capacity to entertain your child for a great number of hours. And with the different natures of these activities, the product can touch on numerous aspects of learning. It can enhance imaginative skills, creativity, logical skills, and critical thinking. This activity cube measures 16 x 12 x 12 inches and suits children aged one year and above. What's Great About It: Being a multi-purpose educational item is undeniably the best thing about this product. Your kid will be able to do numerous things with it, and, as mentioned earlier, they can spend several hours playing with this cube. This word book is best for kids who are learning the letters of the alphabet as well as those who are aiming to expand their vocabulary. 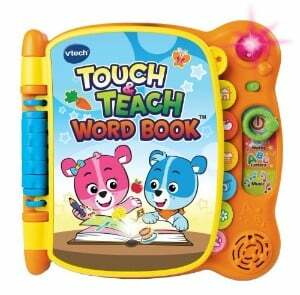 It includes touch sensitive pages that teach your child more than 100 words. 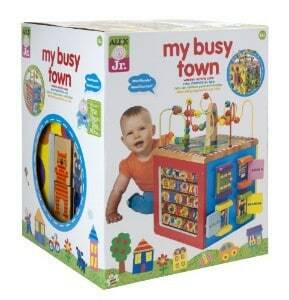 It features four modes of play, namely Letter Fun, What’s That Word, Find It, and Music Time. This may be a good choice during early education. Once your toddler touches the book, the pages react with words, sounds, and music. This educational book promotes interactive play and teaches fine motor skills in addition to the letters and words. It includes two AAA batteries. This baby book is intended for kids aged 18 months to four years old. What's Great About It: The fact that it promotes an interactive game is the best feature of this product. It is like a teacher in a book as it interacts with its little users. 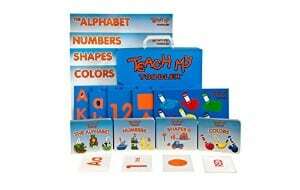 This is an all-in-one learning kit intended for toddlers aged 18 months and above. It is a step-by-step guide aiming to ensure successful development and learning. You may join your kid in playing this for 20 minutes a day. The learning kit features four board books, four posters, 55 flashcards, and seven puzzles. It promotes numeracy, literacy, spatial reasoning, fine motor skills, and hand-eye coordination. It has four sections: The Alphabet, Numbers, Colors, and Shapes. It focuses on the idea of matching, which can prepare your child when learning how to read. What's Great About It: The kit’s capacity to teach various topics to kids (letters, numbers, shapes, and colors) while preparing them for learning how to read is its best trait. In just one product, your little one can have their skills enhanced while having fun. 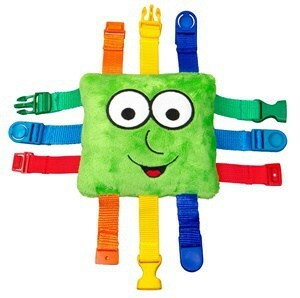 This is a buckle toy that comes with a twist that your kids will love. This product aims to help toddlers enhance their fine motor skills, cognitive skills, problem-solving skills, and hand-eye coordination. It comes with six buckles on twelve straps with various clasp styles and colorful straps that can catch and hold your child’s attention. It also features a zipper pocket that is easy to open, and has numbers and shapes as decorations. Such characteristics can help a child learn early math, particularly counting. Meanwhile, this buckle toy also fits the requirements of special needs children, including those with autism. This product is 6″ x 6″ in size. It fits perfectly in your child's small hands and is ideal to clip onto a stroller, car seat, diaper bag, high chair, and shopping cart. It is light weight and surface washable. What's Great About It: You can easily bring this product with you anywhere; therefore, it can serve various purposes – from a mere source of entertainment to a source of distraction in situations like visiting the dentist. 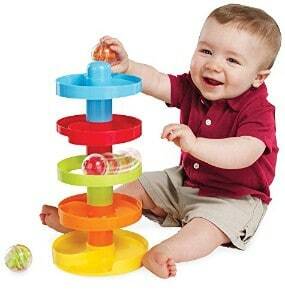 Whether your child is sitting or standing, he or she can enjoy playing with this item. 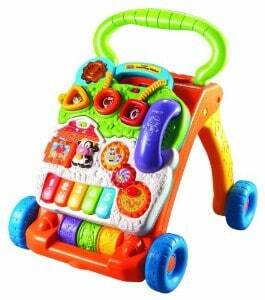 This walker comes with a removable toddler play panel, five piano keys, two colorful spinning rollers, three light-up buttons, and three shape sorters. 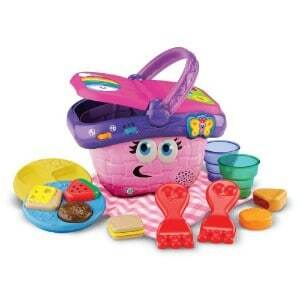 With these features, this toy can help your kid develop fine motor skills and enhance creativity. This product also includes a telephone handset and other mechanical elements, two AA batteries, 70 sing-along songs, sound effects, music, and phrases. It suits babies and toddlers aged nine months to three years. What's Great About It: Being multi-purposed is the best characteristic of this walker. It provides different benefits while also being convenient for your child as they play with it. This ball ramp aims to help toddlers during their early developmental years. It includes five tiers and comes in numerous different colors. The product also comes with 3 activity balls that spin. You can easily build a 12-inch tower and break it for activities on the go. The colorful beads of the acrylic balls make some fun-to-hear noises when you roll them. This ball ramp helps develop cause-and-effect learning, problem-solving skills as well as fine motor skills. It suits children aged nine months and above. What's Great About It: Apart from providing the benefits discussed above, one great thing about this product is the safe material it uses. It is built using PVC that is free from phthalate, ensuring your little one's safety. This flashlight is a projection type of toy that teaches your child about colors, numbers, and animals. It features music and songs that make learning easier and more fun. The product has a ladybug button that activates sounds and interacts with the player. It comes with more than 50 sing-along songs, music, sounds, and phrases as well as five light colors. This interactive toy best suits infants aged one to three years old. It features an on/off switch and two volume controls. It operates on two AAA batteries. This toy automatically turns off when it is inactive for 45 seconds, ensuring that your batteries won't keep running out. What's Great About It: Being an all-in-one item is the best trait of this toy. A toddler’s attention span is generally short, so it pays to have something that can hold your little kid’s attention for a longer time. This product aims to help children learn about animal names, sounds, and shapes. Its five sides and four light-up buttons make this possible. The activity cube comes with 14 interactive features that help enhance motor skills. 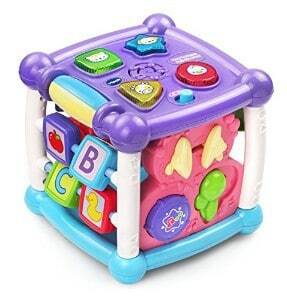 For instance, its music cube helps babies with sitting up and playing. Its motion sensor activates sounds when you move the activity cube. It will catch your child’s attention and will encourage them to start crawling. Its early learning center features 25 songs and melodies. 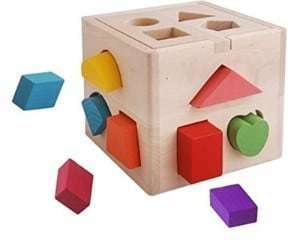 This block toy features BPA-free plastic, adjustable volume, and auto shut-off. It also includes two AAA batteries. This toy suits babies and toddlers aged six months to three years old. What's Great About It: The product’s ability to catch your baby's attention and encourages movement is its best trait. It pays to be able to influence your baby or toddler whose attention span is short. This 14-piece picnic set which includes six food items, two plates, two forks and two cups, is recommended for children ages 6 to 36 months. It is built for easy customization and personalization. What's Great About It: Overall, The LeapFrog Shapes and Sharing picnic basket will create many unique pretend play scenarios that your kids could learn from and will enjoy. This Mirari Pop! Pop! Piano toy has six keys connected to six tubes. When your toddler presses a key, a star from the corresponding tube will pop out. 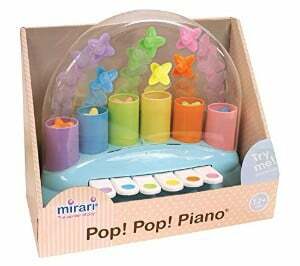 It has two sound modes: musical notes and silly sounds. 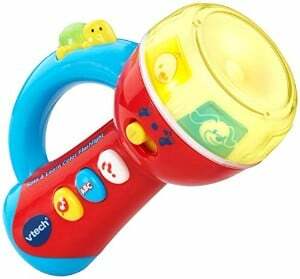 What's Great About It: At an early age, this toy can help your kids to learn about music and sounds. It also encourages the development of their motor skills and the principle of cause and effect. Since the keys are large, your children will not have any problem in pressing them as they happily make their own unique sound. 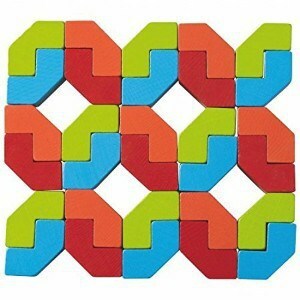 This puzzle toy by Melissa and Doug has 21 wooden pieces. 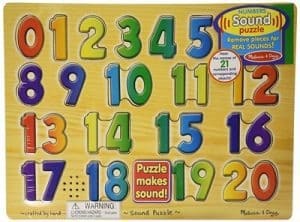 It is light activated and contains full-color pictures underneath each number puzzle which, when the correct number is placed, a realistic sound will be triggered. What's Great About It: It is a very simple and straightforward puzzle toy that helps your kids to arouse numerical learning, matching skills, cause and effect principles, and hand-eye coordination. Even at an early age, you can develop your kid's cognitive skills and their openness to more learning. This cube by Vidatoy has 13 holes made up of different shapes. It is made of wood and is finished with water-based paint. It comes with different shapes all in various colors as well. What's Great About It: This product aims to teach the concepts of colors and shapes by matching the shapes to the correct hole in the cube. It also bolsters your kids’ eye and hand coordination, spatial skills and problem-solving skills. Add these to the fact that this set is made of wood so it is free from harmful plastic chemicals. This Angles to Angles Arranging Game by HABA consists of 32 blocks that are evenly divided into four colors namely red, green, orange and blue. It has a unique design and it made of solid beech wood. The blocks are extremely resistant to wear and tear due to multiple layers of water-based, solvent-free lacquers applied to the blocks. What's Great About It: It can also increase their imagination and creativity by creating different kinds of configurations with these angle blocks, be it by color, by mixing them all up or by shape. It is also good for adults. Generally speaking, choosing toys for little kids is a tough thing to do. You need to consider a lot of things and weigh them according to your child’s specific needs. This is the same when it comes to picking the best scientific toys for your kid. It can also be more challenging if you are the type of parent who is very particular with what your child may pick up from the toy box. Babies and toddlers are sensitive to a lot of things and have very specific needs. When considering a toy, it is a must to give them items that are age appropriate. Failing to do so can lead to numerous unfavorable happenings and some may seriously affect your little one. When looking for educational toys, make sure to be in-the-know of how younger kids’ brains work. Doing so will help you determine the things that can catch your child’s attention and help him or her learn. Don’t pick items that may be too hard for your kid to understand as it may just lead to them really hating the toy. Features are very important when purchasing an item. As much as possible, go for items that offer a lot of great features. You should, however, make sure that they are necessary and can cater your child’s development needs. Some items come with several specs that are good to look at, but are not very helpful for the user. Indeed, it pays to be particular with a toy’s features. We believe we have chosen great toys that are just right for your kid. This criterion is a must for all kids' toys, but is even more crucial for babies and toddlers. As you have read above, we picked toys that contain safe and harmless materials. Babies and toddlers have the tendency to put things in their mouth, so being particular about their safety really pays off. No matter how great a toy’s features are, nothing is more important than ensuring that your chosen toy is safe for your little one to use. How good is your prospective product when it comes to teaching your kid? You may have noticed that we picked educational toys that are multi-purpose. For instance, we picked one that can teach your kids about letters, numbers, animal sounds, and music. There are numerous educational toys on the market, so it pays to be mindful of what each item offers. Make sure your kid will greatly learn from them and benefit in different ways. As mentioned earlier, the attention span of babies and toddlers is short. To be able to catch and hold their attention is a great thing; hence, you should make sure to pick toys that can make this possible. Moreover, you should go for items that can do more than just grab your child's attention. Choose ones that can encourage your child to move and interact with whatever they see. Being able to interact well is important as it is during interaction that your child can express their thoughts and feelings. With these criteria in mind, we believe we have recommended educational toys that have the best traits that you can find in items for babies and toddlers. Educational toys promote sense of recognition. Any toy that appeals to the senses, like brightly colored ones with flickering lights and sounds, will surely interest your kids. The experience will help them develop an interest in certain things. They begin to show a preference or fondness to a particular food, music, color and toy. They help raise smart kids. Educational toys are designed to develop your child’s memory, motor skills, hand-eye coordination and other skills. As your child solves a puzzle, they learn hand-eye coordination. The activity enhances their memory skills by discarding the pieces that doesn’t fit into the space or hole. Your child also learns critical analysis on deciding the right piece to complete the puzzle. It is a good training experience for your child as they face life’s challenges. They help develop your child’s personality. Play sets that involve shapes, numbers, letters or animals and their sounds will help develop your child’s cognitive skills. Ride-on toys enhance motor skills. As your child grows older, they develop fondness to a specific type of toy. Exposing your child to different types of educational toys helps them to develop their own personality and identity. They boost your child’s confidence. Educational toys that require group play encourage your child to interact with others. They learn patience while waiting their turn, respect for the rules of the game, all while becoming more considerate of others and cooperating with them. The lessons learned from the games will make your child better equipped to face life’s demands as they grow older. As the name implies, educational toys are designed to teach your child values and skills which are aimed to be beneficial to both you and your child. Just remember to consider your child’s preference to get the most out of your selection. Needless to say, educational toys and games stimulate the mind and enhance numerous mental skills. When choosing toys for your little one, make sure to include some that can improve his or her knowledge and way of thinking. Choose ones that can sharpen your kid’s memory and enhance creativity and imaginative skills. Also, opt for toys and games that encourage critical thinking. Everyone needs to have strong and well-developed bodies. For toddlers and kids, toys can cater to these needs, particularly the toys that require body movement. While your kid can mostly have his or her body developed by physical games, know that you can also find educational toys and games that can provide such benefits. Both toddlers and kids need to be taught how to interact well with different people. It is then a good thing they can also learn social skills from games. When they play with a team, they become able to exercise their social communication skills and improve them as time goes by. Older kids can freely play with their friends, while toddlers can go to play dates arranged by their parents. While playing as a team can help with your kids’ emotional needs, playing alone can also do the same. In fact, it is during those “me times” that people discover themselves more; hence, improving the emotional aspect of their lives. There are toys and games that your kid can play alone. Consider buying them and see how they can affect your little one. It is never too early to think of these needs. Parents should help their children develop these skills while they are still young. Doing so will help them grow up well and become happy with their lives. You have just learned about the best educational toys for kids and toddlers as well as some important tips that you should follow. Have you picked the best item for your child? We hope you found this piece of writing helpful in choosing a toy for your little one. Best Microscopes for Kids to See Things They Wouldn’t Believe!